Osechi is made from a variety of different ingredients, all of them important for representing something special. For example, Kamaboko, a boiled fish paste is typically red or white and circular, which represents the rising sun. Other items which are important are various types of soy beans, as the Japanese word for them is “mame”, which can also be used to mean health, and to work hard. Japan Centre has a variety of different items which are suitable for making your own osechi at New Year. 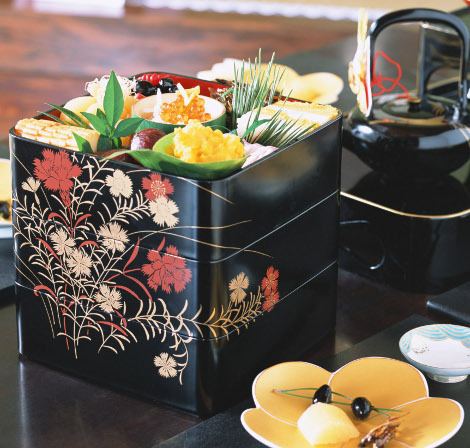 The first step is to get a suitable bento box, which is specially designed for osechi. The one in the image above is called ojyu bako and is a three tiered bento, perfectly suited for the different types of food to served at a traditional New Year meal in Japan. Soba are also traditionally eaten over the New Year period in Japan as they represent longevity for the New Year. They can be prepared in a huge variety of different ways, but commonly served in a dashi based soup. Where as osechi is usually eaten from the 1st January, toshikoshi soba are enjoyed on the evening of the 31st December. Although Christmas is now celebrated in Japan by many people, New Year is the traditional time to give gifts. The most popular gift, especially for children, is the timeless present of… money! This is given in a special decorated envelope called otoshidama bukuro which is filled with crisp bank notes. New Year is a fun celebration for all everyone so I hope that you all have a great New Year and look forward to a successful 2011! Posted in Food and tagged new year, osechi, oshogatsu, shogatsu. Bookmark the permalink.